Combo comes with 30 lbs. Oxycheq Signature wing, SS backplate with harness and FREE harness knife. The "Signature Series" single tank wings are available in 30# and 45# lift capacities. Oxychecq's intention was to design a wing that would withstand extemely harsh diving conditions. Believing tha the diver rarely wears out the outer shell of a wing and the weak point of a wing is puncture resistance of the bladder ... Oxycheq used 1050 ballistic nylon coated with an inner layer of Urethane (very punctre resistant on its own) and then used heavy mil urethane for the inner bladder. Unlike other bladder materials used, urethane is also very easy to patch. This is one tough wing. The "Signature Series" wings share the same outer shape as Oxycheq's original single wings as both models are streamlined, well balanced and built to high standards of quality. The use of a soft expandable gussett allows the wings to be as flat as possible when deflated. The two pairs of grommets, spaced 11" apart, allows the diver to fine tune their trim. 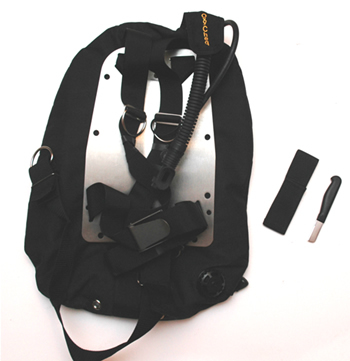 The large CAM strap slots allow you to used our wings with a variety of other manufactures harness systems. The "Signature Series" wings can be used with Oxycheq back plates with a single tank adapter or with the "O-Pac" (no single tank adapater required) or the A-Pac (no single tank adapter required). The "water drains" efficiently dump water. A 360 degree zipper allows easy access to inspect or replace the inner bladder. The stitching used is twice as thick as the normal stitching used in the manufacture of wings.